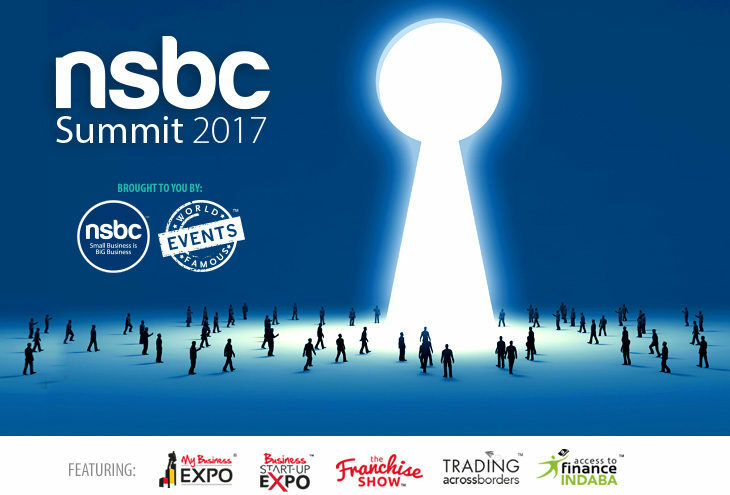 Welcome to the 9th successive season of the NSBC Summit – it’s bigger and better than ever! Africa’s largest, most successful, and much anticipated entrepreneurial event is back in Johannesburg. The NSBC in association with World Famous Events brings you the NSBC Summit. It’s the kick-off event of the year and will take place in only a few weeks on 15 and 16 February 2017 at Gallagher Convention Centre, Johannesburg. As a highlight on the South African business calendar, the NSBC Summit presents an unmissable opportunity for anyone looking to kick-start their own business or to take the next step to growth and success as a business owner or entrepreneur. This unmatched business start-up and growth showcase is host to the highly successful My Business Expo, Business Start-Up Expo, The Franchise Show, Access to Finance Indaba and Trading Across Borders. With hundreds of exhibitors, seminars and sessions, it’s the most successful show of its kind in Africa. Simply put, it’s the place to be and how to get ahead. With just a few weeks to go until the power packed, two-day, all-under-one roof entrepreneurial extravaganza, the 2017 programme promises to be the best yet. It’s where business gets personal with top-of-the-line speakers, business experts, incredible interactive exhibits, world class networking, in-depth education, and off-the-chart experiences. The NSBC Summit draws on leading business experts and specialists who will be on hand to cover every facet of doing business right; from start-up to growth and success. Each event, seminar, panel discussion and presentation is an ideal platform to gain valuable, practical insights to grow, learn, connect and network,” says Mike Anderson, NSBC founder and CEO. “The NSBC Summit is for anyone serious about starting or growing a business,” notes Anderson. “The objective of the event is to give enterprising entrepreneurs, business owners and aspiring entrepreneurs alike the knowledge and tools they need to get ahead and become tomorrow’s successful business leaders. Why attend the NSBC Summit as a delegate? Gain further insights, tips and knowledge at the hundreds of exhibits and sessions over the two days. Network with thousands of like-minded get-ahead individuals. Get exposed to cutting-edge solutions and discover new trends. See all the latest business and franchise opportunities. Get skilled on the tools you need to start-out and succeed as an entrepreneur. Find out more about accessing funding. See how you can take your business into Africa and beyond. Be inspired by big-name visionary speakers, industry experts and thought leaders. Click here to get your ticket. Why exhibit at the NSBC Summit? Showcase your product, solution, idea, franchise or opportunity. Meet face-to-face and do business with thousands of aspiring entrepreneurs, new start-ups and seasoned business owners from all over South Africa, who are all serious about starting a business or seeking solutions to build their businesses.